A regional daily’s bid to help the homeless on its patch has raised almost £25,000 in four weeks. The South Wales Echo’s Reaching out to Rough Sleepers campaign aims to pay for five vehicles which will go out onto Cardiff’s streets to help people sleeping rough. 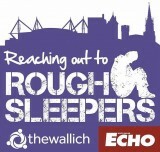 The Echo has a target of £75,000, and so far £24,618 has been raised in partnership with homelessness charity The Wallich. Readers can commit to a £3 a month direct debit, or make individual donations. Editor Tryst Williams said: “We set up this campaign after seeing the comments and letters our readers sent in, outraged that so many people were having to sleep on the streets. “We’ve been incredibly humbled to see the cheques arrive at our offices and all the offers of help. Great effort. Good to see. Just shows newspapers can still play such an important part in their communities. We all know it, but for the love of David, someone tell the bosses!